I’m not good at sitting still. Anyone who knows me will agree. I like to move, explore, be with the people I love, experience, be busy. That’s why I scheduled 5 days on the Abel Tasman Great Walk along the New Zealand coast: to force myself to slow down, process this adventure, let the fact that I don’t have to work or have any responsibilities for the next several months. And I totally failed – I did it in 4 days. But I learned something about myself. Don’t get me wrong, the walk was amazingly beautiful, and it wasn’t that I wanted to rush through it. It’s like the Lost Coast in California meets the Nepali Coast in Kauai, on steroids. Warm sun, turquoise water, golden sand beaches, cliffs diving into the sea. What I discovered on those five-turned-four days in search of zen is that I was telling myself what I should do, instead of what I know makes me happy. I thought I should slow down and process and enjoy. But the thing is that I meditate best when I’m moving: running, backcountry skiing, hiking – these are my zen moments. They’re also the things that make me happiest, that leave me with the endorphin high that I’m addicted to. And it’s when that high ebbs that I love sitting still, watching the waves, and reading my book on the beach. I actually am proud of myself for sitting still as much as I did. 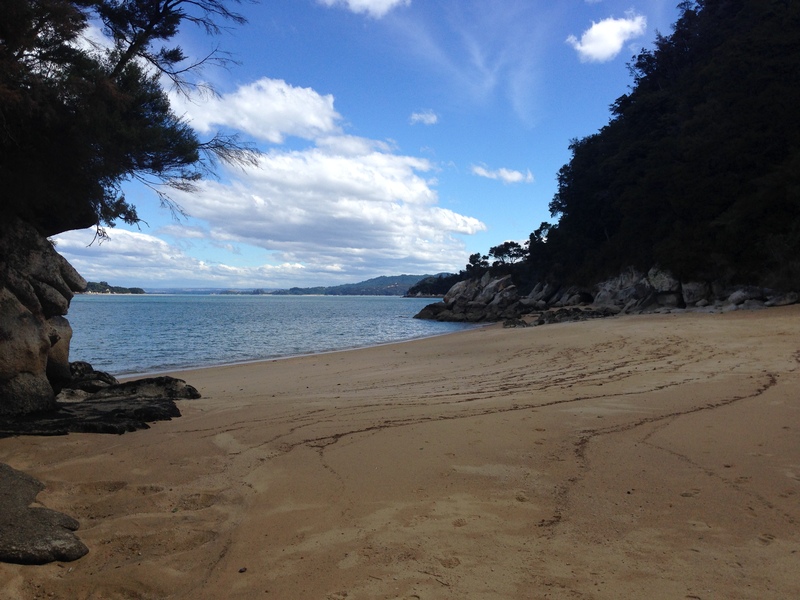 On day 1, a water taxi dropped me at Totaranui and I did nothing but walk down the beach and swim. I met great people that night, and the six of us had dinner together and talked for hours, and then reconvened in the morning for breakfast on the beach and yoga. I started hiking late that day to let the tide go out on the Arawoa estuary before crossing it. 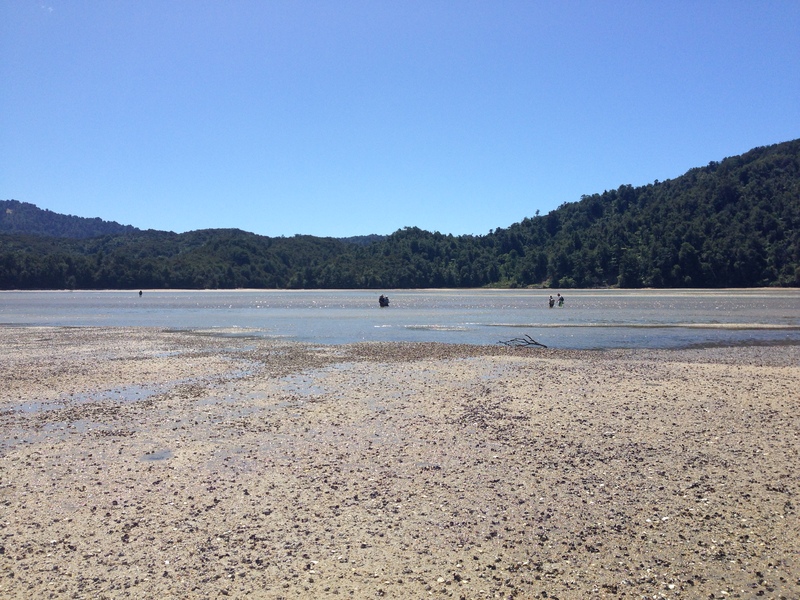 Tides in New Zealand are wild, with low tides leaving a 7-foot-deep ocean a forlorn sandbar. People crossing the estuaries look like refugees in search of better shores. I covered a lot of ground those three days of hiking, but because the days are so long here (arctic in length like Montana, a la Norman Maclean), I had time to stop in secluded bays, to drop my pack and jump in the ocean. So in reality, I didn’t fail. I did what makes me happiest, and I did it exactly right.